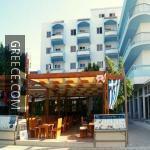 Situated in Ialysos, the Osiris is an easy drive from Rhodes City and Faliraki. This hotel is ideally located in the town centre. The Osiris has cosy rooms, designed to fit the requirements of any traveller. The Osiris is situated under 10 minutes' drive from Diagoras International Airport. The Aquarium of Rhodes, Colossus of Rhodes and the Palace of the Grand Master of the Knights of Rhodes are less than a 20-minute car ride from the hotel.